IN THE STONE-FILLED VILLAGE of Castellarnmare del Golfo facing the dark Sicilian Mediterranean, a great Mafia Don lay dying. Vincenzo Zeno was a man of honor, who all his life had been loved for his fair and impartial judgment, his help to those in need, and his implacable punishment of those who dared to oppose his will. Around him were three of his former followers, each of whom had gone on to achieve his own power and position: Raymonde Aprile from Sicily and New York, Octavius Bianco from Palermo, and Benito Craxxi from Chicago. Each owed him one last favor. Don Zeno was the last of the true Mafia chiefs, having all his life observed the old traditions. He extracted a tariff on all business, but never on drugs, prostitution, or other crime of any kind. And never did a poor man come to his house for money and go away empty-handed. He corrected the injustices of the law-the highest judge in Sicily could make his ruling, but if you had right on your side, Don Zeno would veto that judgment with his own force of will, and arms. No philandering youth could leave the daughter of a poor peasant without Don Zeno persuading him into holy matrimony. No bank could foreclose on a helpless farmer without Don Zeno interfering to put things right. No young lad who hungered for a university education could be denied it for lack of money or qualification. If they were related to his cosca, his clan, their dreams were fulfilled. The laws from Rome could never justify the traditions of Sicily and had no authority; Don Zeno would overrule them, no matter what the cost. But the Don was now in his eighties, and over the last few years his power had begun to wane. He'd had the weakness to marry a very beautiful young girl, who had produced a fine male child. She had died in childbirth, and the boy was now two years old. The old man, knowing that the end was near and that without him his cosca would be pulverized by the more powerful coscas of Corleone and Clericuzio, pondered the future of his son. Now he thanked his three friends for the courtesy and respect they had shown in traveling so many miles to hear his request. Then he told them that he wanted his young son, Astorre, to be taken to a place of safety and brought up under different circumstances but in the tradition of a man of honor, like himself. "I can die with a clear conscience," he said, though his friends knew that in his lifetime he had decided the deaths of hundreds of men, "if I can see my son to safety. For in this two-year-old I see the heart and soul of a true Mafioso, a rare and almost extinct quality." He told them he would choose one of these men would to act as guardian to this unusual child, and with this responsibility would come great rewards. "It is strange," Don Zeno said, staring through clouded eyes. "According to tradition, it is the first son who is the true Mafioso. But in my case it took until I reached my eightieth year before I could make my dream come true. I'm not a man of superstition, but if I were, I could believe this child grew from the soil of Sicily itself. His eyes are as green as olives that spring from my best trees. And he has the Sicilian sensibilityromantic, musical, happy. Yet if someone offends him, he doesn't forget, as young as he is. But he must be guided." "And so what do you wish from us, Don Zeno?" Craxxi asked. "For I will gladly take this child of yours and raise him as my own." Bianco stared at Craxxi almost resentfully. "I know the boy from when he was first born. He is familiar to me. I will take him as my own." Raymonde Aprile looked at Don Zeno but said nothing. "And you, Raymonde?" Don Zeno asked. Aprile said, "If it is me that you choose, your son will be my son." The Don considered the three of them, all worthy men. He regarded Craxxi the most intelligent. Bianco was surely the most ambitious and forceful. Aprile was a more restrained man of virtue, a man closer to himself. But he was merciless.Don Zeno, even while dying, understood that it was Raymonde Aprile who most needed the child. He would benefit most from the child's love, and he would make certain his son learned how to survive in their world of treachery. Don Zeno was silent for a long moment. Finally he said, "Raymonde, you will be his father. And I can rest in peace." The Don's funeral was worthy of an emperor. All the cosca chiefs in Sicily came to pay their respects, along with cabinet ministers from Rome, the owners of the great latifundia, and hundreds of subjects of his widespread cosca. Atop the black horse-drawn hearse, two-year-old Astorre Zeno, a fiery-eyed baby attired in a black frock and black pillbox hat, rode as majestically as a Roman emperor. The cardinal of Palermo conducted the service and proclaimed memorably, "In sickness and in health, in unhappiness and despair, Don Zeno remained a true friend to all." He then intoned Don Zeno's last words: "I commend myself to God. He will forgive my sins, for I have tried every day to be just." And so it was that Astorre Zeno was taken to America by Raymonde Aprile and made a part of his own household. Omert?, the Sicilian code of silence, has been the cornerstone of the Mafia's sense of honour for centuries. Born in the Sicilian hills, omert? carried the Mafia through a hundred years of change, but now at the century's end it is becoming a relic from a bygone age. Honour may be silent - but money talks. 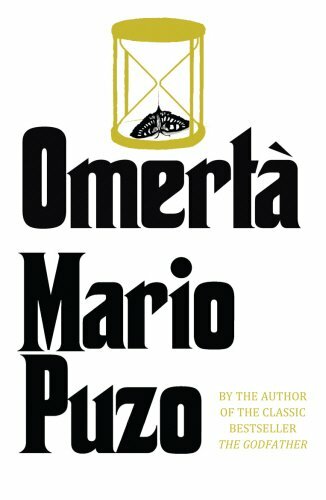 Puzo's explosive story set in New York follows the lives of mafia dons and revolves around assassinations, blackmails, betrayals and the unspoken and sacred code of silence: omerta.